W I N N I P E G F R E E P R E S S S P E C I A L F E AT U R E | S AT U R D AY, O C T O B E R 2 5 , 2 0 1 4 Welcometo WeDayManitoba2014 canadinns.com CanadInnsbelievesinManitobaYouth Weareproudtosupportourstudentsandschoolsin fundraisingeffortsonbothalocalandgloballevel. CanadInnswastheCo-Titlesponsorofthefirstever WeDayManitobaandareproudsupportersof FreeTheChildrenandWeDay. 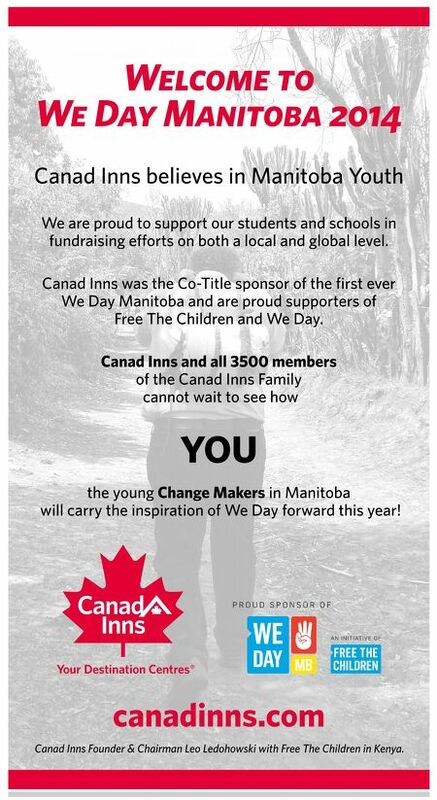 CanadInnsandall3500members oftheCanadInnsFamily cannotwaittoseehow YOU theyoungChangeMakersinManitoba willcarrytheinspirationofWeDayforwardthisyear! CanadInnsFounder&ChairmanLeoLedohowskiwithFreeTheChildreninKenya.